Make it yours: you could add sherry or white wine along with the chicken stock but remember don’t use too much liquid otherwise it turns more into a soup rather then braised pork. Because it is such a inexpensive cut, braising is the best way to cook it. Put chicken in a bowel and drizzle with olive oil and sprinkle with salt and pepper. Place the fillets into a hot fry pan and slightly brown on both sides. (the rest of the cooking will take place in the oven). Using the fry pan add the chopped onion and sauté. Do not add any extra oil. Put in the wine and let it evaporate. Bring to a boil and pour over the chicken fillets in the baking pan. Using a food processor, add the bread, salt, pepper and grated parmesan. Pulse until the bread has broken down in to small pieces. Add the butter and pulse 1-2 times. Add the parsley and pulse to mix. Place onto of the chicken fillets. Bake for 25-30 minutes, or until the crust turns golden brown and crunchy. 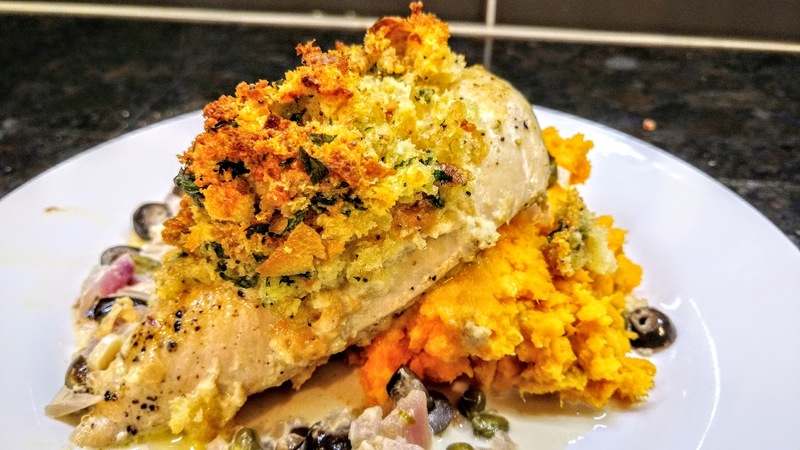 Ensure the chicken is completely cooked.When ready, remove from oven and serve with mashed pototes or sweet potatoes. Options: Add some fried leeks to your potatoes to add a little kick. Combine smoked paprika, garlic & onion powder, cayenne pepper, dried oregano, basil, salt and pepper together and place in a sealable plastic bag along with olive oil. In a medium hot pan, add butter and place coated chicken breasts in pan. Fry 4-5 minutes then turn over and continue to fry for another 4-5 minutes or until cooked. Continue heating sauce until it thickens about 10 minutes. Serve chicken over either a bed of rice, pasta noodles or spaghetti squash and ladle sauce over top. Remove from the oven or barbecue. Cover with foil and let stand for 15 to 20 minutes before carving. Melt butter in large skillet. Add onions and celery, cook stirring until tender, about 5 minutes. Add seasoning and pour over bread in a large bowl util well combined. Gradually stir in broth until just moistened. Do not wet.